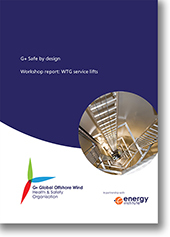 This workshop report draws upon outputs from the G+ Safe by Design workshop held in September 2016 which explored a number of key topics associated with offshore wind turbine service lifts. Following a fatal incident occurred in Germany when a service lift failed on an onshore wind turbine the G+, as the leadership organisation for the industry, convened this Safe by Design workshop and also took a proactive approach to the sharing of service lift safety information, engagement with service lift Original Equipment Manufacturers (OEMs) and supporting further industry research to assess whether service lifts are fit for purpose. Each G+ workshop will examine the current design controls relating to a particular topic, discuss where current design has potentially failed, identify opportunities for improvement and then seek to demonstrate the potential risk reduction to be gained from these new ways of thinking. The findings from each workshop will also be made freely available in reports which can be downloaded from the G+ website for the purpose of safety improvement.